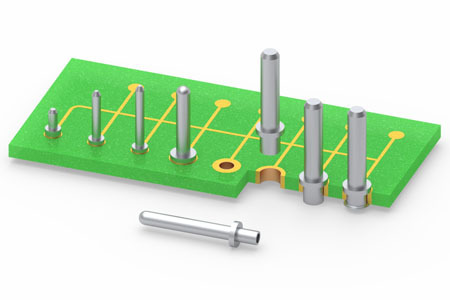 Swage pins are often thought of as wire-to-board soldering terminals and test points or as hardware such as PCB standoffs, but they are also an excellent choice for board-to-board interconnects. They are cost effective due to their simple design, don’t require the more precise PCB hole specifications associated with most press-fit pins and can be processed in volume with semi-automatic or automatic equipment. Swage assembly is a method of mechanically fastening pin terminals to a circuit board, similar in style to riveting. After the pins are swaged, they are soldered, providing a robust mechanical and reliable electrical connection. The swage pins featured here are offered in various diameters and lengths to suit a wide variety of interconnect applications. They are useful when space is limited, near the edge of a board for example, where a connector with its housing is not an option. The swaged pin takes up relatively little space and is secure without the need of an insulator. The longer pins are perfect for overcoming the height of taller board components (large capacitors, transformers, power supplies, potentiometers) to connect to a daughter card or other module, while the low profile 4658-0 may be used on boards which are primarily SMT, to keep the overall stacked board assembly height to a minimum. All the pins are high speed precision turned from brass alloys and annealed to prevent cracking during the swaging operation. The standard plating for these pins is matte tin over nickel with other plating options available upon request.